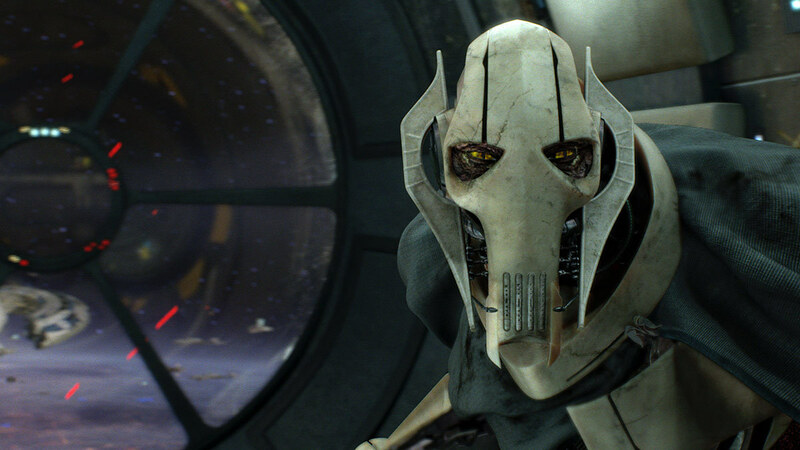 General Grievous actor Matthew Wood is open to revisiting the character for a Star Wars anthology movie – AiPT! An interview with General Grievous actor and Skywalker Sound’s Supervising Sound Editor Matthew Wood at ComiCONN! Solo: A Star Wars Story made one thing very clear to fans–Disney isn’t afraid to revisit characters introduced in George Lucas’ prequel trilogy. One of the prequels’ most iconic villains, General Grievous, was voiced by Skywalker Sound’s Supervising Sound Editor Matthew Wood, who also happened to be at ComiCONN June 30 and July 1. I caught up with Wood at Connecticut’s Foxwoods Resort Casino to talk Star Wars, sound and, of course, General Grievous! Warning, spoilers for Solo: A Star Wars Story ahead. AiPT! : With Maul’s return to the big screen, we’ve seen Disney isn’t afraid to dip back into the prequels. If they ever wanted to bring General Grievous back for a Star Wars Story, would you be willing to come back and voice the character? Matthew Wood: Oh absolutely. I love the prequels. I worked on all of them, I have super fond memories of working on those movies with George Lucas and then, obviously, I did The Clone Wars series with Dave Filoni, which George Lucas was involved in. And any of the little projects we’ve done since then for video games what not–I’ve reprised the role and I’ve always enjoyed that character. He’s a complex soul, he’s a tortured soul. And then I do the voices of the Battle Droids as well, so it’s always a nice banter between Grievous and his droids–his frustration and their idiocy. And then LEGO took the droids into a place to be like good characters in the Freemaker series, so I did that. Yeah, I loved the prequels. They were super fun to work on and being with George Lucas was a great memory. AiPT! : As Skywalker Sound’s Supervising Sound Editor, you’ll be working on Star Wars: Episode IX. Could you talk a bit about what you do in that role? Wood: The Supervising Sound Editor role at Skywalker Sound–I’ve been doing that for about 28 years now, and it’s basically anything you hear in a movie that’s not John Williams’ music or not the composer’s music. It’s filtered through my department and I have to make sure the director gets the sound that he wants for the movie. Sound is like a character–it’s a subconscious sort of portal into the viewer’s mind that’s not on screen. So it’s all emotional and it really can drive story and that’s what our main goal is with sound–to make things seem more expansive and bigger than they are on screen and drive the story forward. That’s what our job is and I love doing that work at Skywalker Ranch in northern California. We’re really looking forward to getting Episode IX underway with J.J. Abrams coming back–it’s very exciting for everybody. I’m looking forward to that. AiPT! : So are you doing any pre-production work on Episode IX right now? Wood: They’re in pre-production, yeah, they start shooting fairly soon over at Pinewood Studios in London. Right now, I just came off the Solo project–I supervised, did some voice work in that with Ron Howard and I’m actually taking a little vacation. We’ve got The Resistance–that’s happening right now, which is the animated series that we’re doing after Rebels. We’ve got Resistance going on, then Jon Favreau’s been tapped to do work on a live-action series for Star Wars too, so we have a lot of things going on. It’s a big time for Star Wars. AiPT! : Yeah, I remember when I saw Revenge of the Sith in the theater, I assumed that would be the last time I ever saw a new Star Wars film in a cinema. That clearly wasn’t the case. How do you feel about today’s Star Wars resurgence? Wood: It’s been great. I was a huge fan as a kid. Episodes IV, V and VI were like my favorite movies ever, so to be able to work for that company was a dream come true. When George Lucas wanted to retire, I as well thought when he finished Sith he was very happy and told his story and was content. Where I work at Skywalker, we don’t just do work on Star Wars films, we do other studios’ work. So in between Star Wars movies I worked on a lot of other films there. So when he wanted to retire from filmmaking, he put us in the hands of a company that really knows how to make movies. I mean, George was a huge fan of Walt Disney. I know personally, he really enjoyed Disneyland and the parks. The dreamer-businessman-person Walt Disney was–I’m sure was an inspiration for George. He and Bob Iger worked out a great deal to sell the intellectual properties of the company to Disney and all it’s meant for me and a lot of the other artists that work on the movies is we just have more work and a lot more exciting projects and new directors coming in and it’s increased our workload tremendously, which has been great for me too because I get to enlist a lot of new people into the sound world and bring in people who have never worked on Star Wars before. You get to see their excitement and how they feel about it. It’s been good for me to finally have that since I’ve been there so long–to see new people get really inspired by Star Wars like I did. AiPT! : And how do you end up doing voice work in some of the films? Wood: Well, I’ve always been an actor. I was trained at the American Conservatory Theater in San Francisco and did as much theater as I could while working at Lucasfilm at night. For sound work and voice work, I use the same equipment, so there are a lot of times in sound design where I’m working on a voice for a creature or something and I’ll put mine in there as a test and it ends up working out similar to what Grievous was as well. General Grievous was a thing where George was looking for a particular sound of a voice and he auditioned 50 actors or so and he wasn’t getting what he wanted. Almost out of frustration and necessity, I put my own voice in there and did it under an assumed name and he actually ended up picking it out of a group of 20 actors. So that ended up opening a lot of doors for me and I got to get involved in voice work. I’ve really enjoyed voice work because it allows me to still act and I don’t have to go physically audition and work with people with my face, because I just wouldn’t have time to do that with my sound job. It’s a different part of my brain, but it’s still the audio department I enjoy. AiPT! : It’s especially nice to be beloved by Star Wars fans but not have a face as recognizable as Mark Hamill’s. Wood: Exactly. My only experience with a lot of fans recognizing me is at Star Wars Celebration or somewhere people have seen behind-the-scenes material a lot. I’m glad that I can just have a normal life, because I love having my normal life and just weekends to myself and all that, but I also enjoy meeting fans from Star Wars and getting to have that 1:1 interaction with fans is really inspiring. But I love to be able to turn it off and have my life, so it’s the best of both worlds for me.